Arguably moreso than other forms of music, classical can enrich and and stir the soul in ways that require incredibly lengths of comprehension and description to truly appreciate. To put in words what the body and mind experience when listening to a classical composition would be to draw lines between what is and what isn’t music in these complex theoretical forms that we give life to. Looking at definitions of aesthetics, pleasure, symmetry, and other elements that go into all forms of music, we can create an idea of what classical music is and why it’s so important to many of us. I write this as I listen to Ravel’s “Pavane for a Dead Princess”, a piece I had the honor of playing in my high school orchestra class. I see various YouTube videos promising that their playlists of classical music are beneficial to brain power. I’m incredibly dubious of those claims, but I believe we can find a sort of intellectual enlightenment with a philosophical appreciation or reflection of the music itself. In making sense of these auditory forms of art, we need clear guidelines such that we can interpret musical sounds as representations of objects only where it is appropriate and justified to do so. Our human ability to interpret and assign meaning to music and what that means for humans and other forms of art must be investigated to understand the way our aesthetic ability works. It appears that music has the capacity to engage our aesthetic sensibility without also engaging the cognition of objects. This sensibility is linked in complex ways to inner experience, feelings, moods, and emotions. Generally in Western tradition, we can turn to Plato for a very early account of what the philosophy of music truly is and what it entails. But the music and its role in society has existed long before Plato, and, to dig down to the earliest discussions of music, we’d need to understand the nature of that music itself. Still, Plato’s account of music provides a relatively suitable starting point given all the information in his works the Republic and Laws. During Plato’s time, the discussion of the special power of music to shape our inner life predates Plato, as evidenced by the lively debates of the pre-Socratics on this topic. Plato believed that music as an art that can bypass reason and penetrate into our innermost self, impacting the constitution of our character. Music functions in a way like a “charm” on our inner life, shaping this life to its pattern. Classical music in particular stands out among musical cultures for its ability to evoke compelling inner experiences in the listener. Plato believed music had this direct effect on the soul. One might argue that the power of classical works to evoke such experiences appears to be heightened in many purely instrumental works despite the fact that such pieces possess no readily identifiable meaning. It’s as though using composition that don’t require immediate understanding, but, rather, rely on deeper, more nuanced forms of understanding meaning can evoke more authentic, enriched experiences. Though I was an aficionado of classical music in high school, I turned my back to it when I entered college. I mostly wanted to forget and rid myself and many negative and unwanted memories I had associated with the music in high school. Feeling as though it was part of a past that I was desperately trying to move on from, I even distanced myself from friends in high school that I enjoyed classical music with. Instead, I turned to rock, hip hop, and pop music in college, and found them just as fulfilling as I had done classical. And, though I studied physics and philosophy in tandem and I searched for meaning and beauty in any discipline I could come across during my undergraduate years, I found little reason to listen to classical music. Over the past three weeks, I’ve started listening to classical music around 1-2 hours a day. I’ve re-connected with old friends from high school with whom I shared these musical experiences, and voiced my thoughts and memories to them. It was an incredibly difficult task for me to take on at first, as I found myself washed away by intrusive thoughts and memories from my high school years. All of the experience and pain I put into myself to try to understand the meaning of Saint-Saën’s piano concertos or Ravel’s “Bolero” came flooding back. I was immediately overwhelmed and felt forced to ease the experience with frequent walks and tons of coffee. As time went on, though, the experience lessened. I became more familiar with the thoughts and emotions that took my mind hostage and have now approached a point at which listening to classical has become a routine for everything I do. As I listened to more pieces by composers such as Shostakovich and Beethoven, I find myself more at ease with the way I perceive the world. With a refined sense of musical feeling and thought, I’ve slowly begun to lose interest in contemporary music (namely, rock, hip hop, and pop), and found myself more and more interested in the work of Wagner and Mozart. The sort of aesthetic inquiry that I could take with this music, though, required more research on my part. I wanted to understand what it meant to truly appreciate these forms of art no matter how archaic or esoteric they may seem. I’ve re-kindled the sentiments that I carried with me as a teenager playing in my high school orchestra and now seek deeper meaning behind this experience. According to the Internet Encyclopedia of Philosophy, the three features of classical music which shape its aesthetic inquiry are music and the inner experience, the temporal aspect of classical music, and classical music as historical tradition. As I listened to the music, I thought about what sort of inner experience I was undergoing. Classical music engages the inner experience, and we need to understand how and why this connection is so strong. This meant thinking about what exactly in my subjective experience is caused by the classical music and how I can put those things into words and thoughts. Relying on only our auditory senses causes music itself to differ from other forms fo aesthetic appreciation. To venture into these experiences inside of our own self requires defined meanings and values on what music. For me, the classical music represents a message no matter who the composer is. As a listener, I had to understand what that message was, whether it was the formation of different harmonies coming together or notes that produced a pleasurable chord. For a representation of something using music to be an object, we rely on some sort of ability within ourselves to interpret and assign meaning to these auditory perceptions. Even in the absence of what we might call musical objects we find thoughts, sentiments, and perhaps even arguments put forward by music. With classical music, this inner experience is very pronounced as it allows us to appreciate the art form for what it truly is. We understand deeper features of classical music, such as how its temporal in the way its guided by time itself. It’s almost as though we move along with the music or that music is holding our hand as we listen. This puts music as something greater than simple idle thinking. It’s more akin to poetry or spoken word, but with a greater emphasis on rhythm, pitch, and other musical features. We listen to it just as the composer intended us to listen to it (though there are arguments that the performance is more pivotal than the composition). The relationship between the movement of music to physical motion creates an experience in which we can put forward different interpretations of classical music itself. I can then evaluate my subjective experiences of classical music against these arguments and meaning I draw from this relationship. One might even use a metaphor that music is the ocean and winds upon which we guide our ships. This response of our minds to music can be automatic, as well, in the keenest, most primal perceptions that we have about music. We can put these guidelines and rules of classical music in context. These Common Practice rules came to define the Common Practice era and much of the backbone of all of Western music. Through the ability of the composer, listeners can determine what sort of creative effort went into producing these pieces just as we would comment on any other form of art. This forms the basis of our aesthetic attitude of music and allows us to raise questions such as what sort of appreciation might be possible, where the aesthetic value comes from, how formal the value needs to be, and what sort of relationship we have with the aesthetic value. We determine these questions and ponder their solutions as we listen and even as we reflect on the way we listen. For it’s even arguable whether our experience of listening constitutes the experience of art itself. And these questions of music are so fundamental that they should reflect all of music. As composers followed the historical tradition of the Common Practice era, they found themselves united by their feelings towards their music. However intimate they chose to be, they could put forward those emotions into their music. These compositions would be performed at ceremonies or other rituals. Perhaps it is my tendency as a lover of philosophy to look for absolute, universal truths in music. It’s difficult, though, as whatever harmony that united people in a shared language I have yet to fully understand. As I listen, though, I wonder what sort of shared feeling an audience may have when the piece is performed at a concert hall. As it was written to be played alongside everything else in society, whether it was a religious observance or a holiday, the music carries the meaning of its societal role as well. As I researched the history, I discovered how the tones and harmonies in the music would shape the cultural era of each time period, whether it was around the time of Medieval and Renaissance thinkers like Niccolò Machiavelli and Francis Bacon in their art and science. Through this, the music truly just as important as other forms of art. I came across the paintings of Edouard Léon Cortès, a French post-impressionist artist who lived during Schoenberg’s time from the 1882 to the 1969. My curiosity lead me to understand what sort of musical background would have set the stage for Cortès’ creativity. Through my reading in the philosophy of classical music, I’ve come to know how this conception of classical music became shared across Europe, allowing artists, scientists, and writers to share the culture of different countries. Using these similar tools (like scales, rhythms, harmonies, etc. ), composers could extract meaning. I’ve come to hypothesize that the diatonic scale (the set of notes used in virtually all of Western music) and other salient features of music are part of our own nature. They weren’t artificially nor arbitrarily constructed. I briefly perused through writing of composers like Wagner and philosophers like Theodor Adorno (including the latter’s beliefs that we can locate truth-content in the art object, rather than our own subjective perceptions) and have started to think that our relation with music is much deeper than just as culture would dictate. Even as time went on for the composers of the Common Practice period began using innovative techniques and expanding their uses of the tonal system. For this reason, I think philosophical truths and ideals we draw from this period should take into account the potential for music and not limit itself to only the musical pieces themselves. The philosophers of classical music aesthetics should also focus on non-tonal classical music. I use the comparison between the artwork of Édouard Cortès and classical music to draw attention to the aesthetic value of the latter. The painter created his works at the height of creativity in France, and, as such, the composers of the time like the expressionist Schoenberg could have influenced his work. 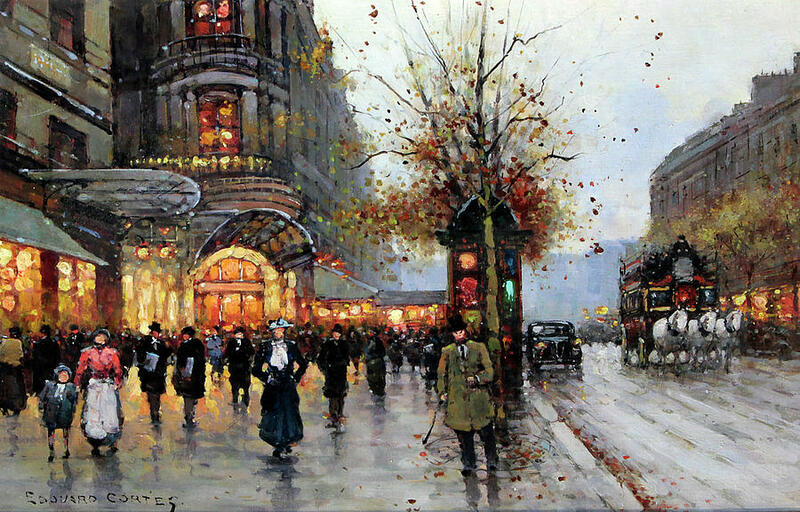 As I contemplate the work of painter Cortès while studying aesthetics of classical music, I wonder of the atmospheric qualities of weather of Paris that the artist captures. I also think about how our eyes perceive weather and the similarities of the sparks of paint to the glistening of sunshine and raindrops. In some of his evening compositions, the dark sky falls with delicate care and imagination, as though it were part of our interaction with nature itself. I want to conclude that these aspects of man’s interaction with nature fits perfectly with the aesthetic values of classical music that portray fundamental, natural perceptions of man. Similarly, with a musical ontology, we raise metaphysical questions of a music. Is there a “painting” we can observe that represents pieces of music? How are those values and meanings expressed through music? It seems as though someone following the teachings of Plato would believe that classical music is an abstract object. I could evaluate the painter’s works through this meaning of music. More questions of classical music could be raised such as how much information is necessary to determine a piece of music is a performance? Does one have to perform exactly the same piece that was written by the composer or can someone’s instance of performing have its own level of difference? I believe we can understand how the fundamental rules and guidelines of music are followed to determine our notion of music and how it changes over time. Then, of course, the audience listens to music after a performer plays it. This audience can get a glimpse of the authenticity, but not the exact same authenticity that a composer originally intended. For all of of us, we view history through our own eyes and are limited by all these factors that affect music itself. And finally, one of my personal favorites by Mikhail Glinka. The information in this blogpost is largely taken from the Internet Encyclopedia of Philosophy.